Suitable for even large numbers of data points in both the chemical or biological data domains. Also powerful when calculated columns are to be inserted into tables. The filter and label function is a very powerful feature when subsetting data within one Spotfire project. It is also capable of exporting sheets to PDF format, so it is also convenient to share key findings with others. It is less appropriate for chemical data in less mainstream formats (e.g SDF, MOL2). We have found a ton of bugs in there, our implementation is very complex and we use a lot of features, but we wish there were less bugs. Particularly with parameter display and validation. Actuate has decided not to continue to support the birtondemand platform and it is running on older versions of their main platform. Building out security extensibility is rather complex. They have not had a rest interface until new versions of iHub. Even though Spotfire does have bugs and inconsistencies and other shortcomings, it's certainly doing a great job overall. It provides great value for the money and is user-friendly enough. This is a wonderful product that is easy to learn. The support of the company allows users to become experts of the product in no time. The Spotfire client is very reliable. There are sporadic crashes that are made worse due to the lack of an auto-save. Most product upgrades are uneventful. The one major issue we experienced was quickly responded to by Tibco. Our system admins have indicated that the Spotfire servers and the ancillary web-player systems are reliable, but requires time to learn how to deal with the unique nature of the web player and resource loading. Spotfire can store data in its memory, and that data can be shared across multiple users. This way users who log-in at different times don't have to wait for a report to fetch the data from database. I have had great success with the support of the product. The implementation seemed to be a smooth change. TIBCO Spotfire has a definite advantage over competing programs due to its user-friendly interface that requires no understanding of programming language to produce effective graphs. Spotfire also excels in producing graphs that display multiple variables on all axes, which the other programs I have used generally have trouble doing in an as effective way. The program has proved to be very useful and allows for analyzing various forms of data. Using Spotfire has saved my time in making presentations for oilfield clients, where the data is gigantic. I have more skill as a business analyst now. The graphs and plots of my work are very unique. 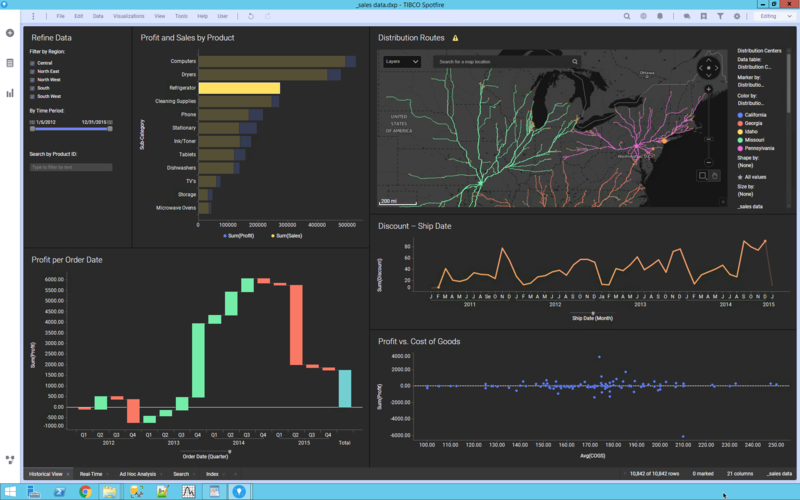 For Enterprise engagements, please contact TIBCO directly for a custom price quote.